The Return of the King Study Course: Online Live! 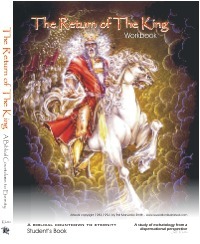 The Return of the King Study Course will be presented at First Baptist Church in Needville by the author and pastor, Jeff Kluttz beginning Sunday, February 14th, 2010, at 6:00 p.m. The course will also be streamed live each week for those outside the Needville area. The Return of the King workbook course was written as a twenty hour study of eschatology (end times) from a pre-millennial perspective. However, it has been asked on several occasions if the material could be offered at a slower pace than is required for the 20 hour course completion. To that end, and because this particular series will be presented in the author’s home church, this presentation of the ROTK material will be expanded in content and taught without time limitations. Some topics which are normally engaged briefly will receive more detailed attention and no areas of study will be shortchanged because of time constraints. Under these conditions, participants should expect that this session will endure well beyond twenty weeks. Class time will be for one hour each week, with a question and answer time following. Students desiring to participate on location must fill out a registration form to reserve their workbook and make plans to be in attendance at First Baptist Church each Sunday evening for 20 plus weeks. Workbooks will be provided at a reduced rate to local participants at $7 each. Bring the $7 book fee to your first class. More information and directions to First Baptist Church can be obtained at the church website at www.fbcneedville.org. Those desiring to take the course via the internet need only to secure a copy of The Return of the King Student Workbook and schedule computer time each Sunday evening at 6:00 p.m for an hour to an hour and a half. No reservations are needed, as the live stream will be available to any and all who desire to watch. Yet, a Return of the King Student Workbook is highly recommended, as the vast majority of the course work will use that workbook as a guide. Workbooks are $9 online and can be purchased here. Live-Streaming of the course will be viewable at http://www.needville.tv/. PLEASE NOTE: Courses are streamed live and in real time. If you miss class, there is no makeup system in place.